Having, on occasions, wasted a morning fiddling with things rather than getting on with something constructive, I end up feeling depressed and dissatisfied. Often, rather than berating myself for lack of motivation, I inwardly complain of boredom, when I should be instead, comparing myself to those that not only are motivated, but also spend their time voluntarily helping others to motivate themselves and achieve more from their lives. Having recently sent the manuscript for ‘Shadows in Sunshine’ off to my publishers, I confess to wasting a few days in idle pursuits up until I kept my appointment to talk at the Mayor of Gosport’s Tea Party. 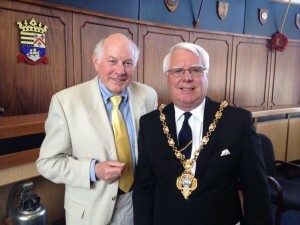 There I met again John Beavis, the energetic Mayor of Gosport who had arranged several ‘Tea Parties’ amongst other charity fund-raising events during his term in office. The first of the charities supported was ‘motiv8’, a charity formed mainly of young people who give up their time to work in the community, helping those youngsters identified as needing encouragement and support, and working with them and their families, culminating in supporting the youngsters into employment. Website:- www.moti8south.org.uk. Next was another valuable community charity ‘Connect Advocacy’ who support adults with learning difficulties. What sterling work these people do in helping those who often fall victim to Hate Crime and Bullying, enabling them to have a voice. His third charity was one associated with his love of sailing. The Royal Yachting Association’s ‘On Board Scheme’ is designed to encourage those of all ages to become involved in the sport of sailing. Check out a sailing club near you to see if they are, like Lee on the Solent Sailing Club, supporting the scheme. If you haven’t given it a try, go along and learn the ropes. You never know, it may be just the positive pastime you are looking for. Website:- www.rya.org.uk/programmes/onboard. Three charities all connected with motivation and encouragement, run by people who set out to improve the lives of others in their community. I am pleased to say that my talk was apparently well received, and the event raised a few hundred pounds to support these deserving causes. The main win for me however, was that the event, and meeting a few of those charity workers, gave me some much-needed motivation to get on and do things that are constructive and positive. This entry was posted in Uncategorized and tagged Inspirational youth work, Mayor of Gosports Tea Party, Motivation, Support to adults with learning difficulties on May 20, 2014 by Richard V Frankland.